Like many members, I am very proud of much of my Party’s back story on the NHS but we are definitely going to lose the NHS if we don’t actually stop the Tory’s current plans to give Accountable Care Organisation (ACO) contracts to the big private health companies. In 2010 the Tories started cutting the NHS budgets, then by 2012 they had removed the Secretary of State’s responsibility for citizen’s health with widespread repercussions (eg he no longer has the responsibility to address air pollution, flood risk and similar public health issues). However it was the plan to extensively privatise the NHS by insisting that all contracts must be re let every 3 years and open to financially competitive bidding that caused such a cry of pain in the service. At the time I was a Commissioner of Health and Social Care services and had already cut the services that I was responsible for to the bone; the pressure to keep cutting was totally unrealistic even then, as many staff in key services were under so much stress that their own health was suffering. It was at that point that I decided that I could not keep cutting and left my job. The trickle of contracts let to private companies in 2013 has speeded up now but the big companies are still not happy with their lot and have been busily lobbying for more change. They want much bigger contracts to bid for in order to reduce their overheads and gain access to both huge ‘markets’ and to incredibly valuable personal data. Accountable Care Organisations are the tools by which this government wish to roll up all the small contracts up in great big ones. 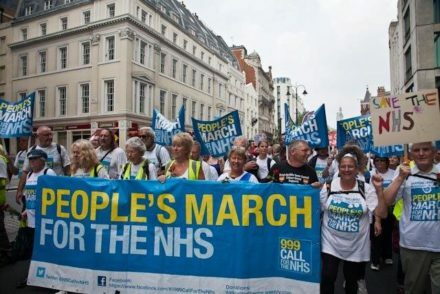 The country has been split into 44 NHS areas and each one required to identify where they can cut expensive health services and where they can sell off property in order to subsidise health care. Even Frimley Hospital that the PM visited last week, which is one of the best run in the country, has to sell off precious land and resources to plug the gap that has opened up by this Government’s failure to fund the NHS sufficiently. The governments plans will open up many more opportunities for litigious companies to sue the hell out of us and next time it won’t be thousands, it could be millions or billions. With the desperate pleas coming from NHS staff around the country, struggling to provide a decent service, it is difficult to see past the immediate crisis and focus on things the Tories don’t want us to think too much about. However should ACO contracts be let to private companies, their access to the personal data of huge communities will be unprecedented. NHS England currently receives restricted data from all publicly provided health services. The type of information that would be available to a private health company that provides an ACO would be more extensive, give access to entire medical notes and social care assessments and therefore many more pieces of very sensitive information such as patient’s financial position, family members, workplace and even criminal records. The mining of personal data provides endless opportunities for both good and evil: Of course there could be real progress in medical research should extensive mining be undertaken by the NHS and our university’s medical scientists to identify causes and cures for illness but is that what will really happen? The sort of extensive health data that will be under the control of ACOs would be a gold mine for Big Pharma, their access to it could result in an increase in ways for them to extract value from sickness rather than improve our health. In 2016 DeepMind/Google mined health data for ‘free’ in exchange for what they learned https://www.newscientist.com/article/2086454-revealed-google-ai-has-access-to-huge-haul-of-nhs-patient-data/ Last but not least, spare a thought for the parent company that provides health & social care services as well as insurance, Virgin spring to mind. Do you trust Mr Branson with your data? Fiona Dent was Labour’s candidate for Runnymede and Weybridge at the general election.